This is just a public notice of my intent to go forward with the changes that have already been implemented on the Test Server during the last tournament. I'll outline the changes below for those of you who are unfamiliar. I also intend to give everyone who's donated for a nation flag previously a special superstar donator nation award that will not be available to anyone else, because I know it can seem unfair that you donated to get something that now everyone will have. Why should the trade wars only happen in real life? This next change isn't exactly centered around trade wars, persay, but it does add meaning to Colors, which have otherwise been a pointless, free money mechanic. The Colors, which you all know and love, are going to be transformed into Color Trade Blocs, which are blocs of nations that have a sort of trade deal together, and as a result, get bonus income. Sounds a lot like the existing system, right? Well, let me tell you why this new system is way cooler and more fun. 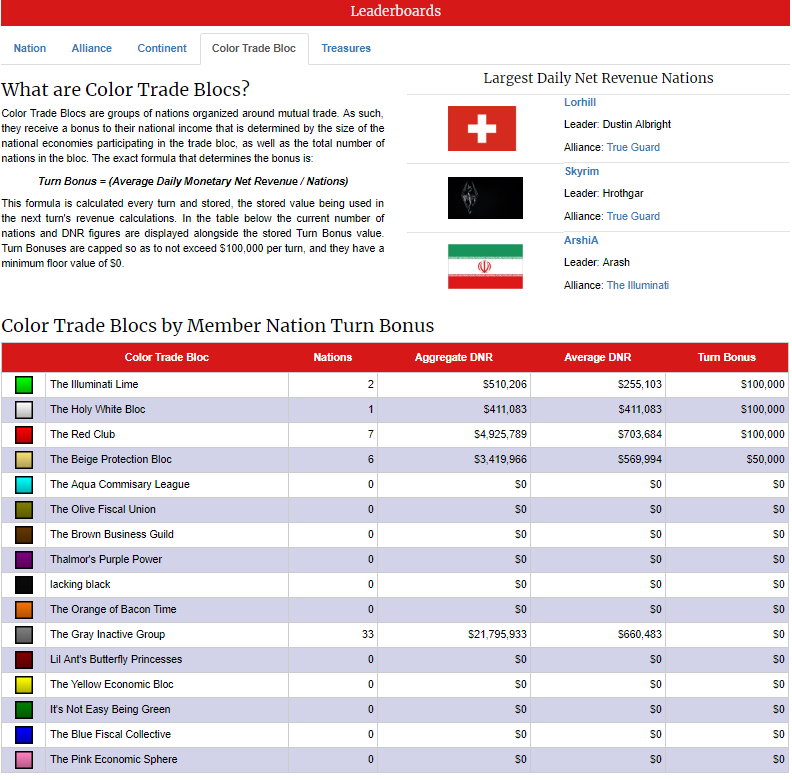 Instead of basically every nation in the game getting the same 3% flat bonus to gross income, the Color Trade Bonus is calculated based on the average monetary net income of all of the nations on a given color, divided by the number of nations on that color. As a result, the incentive is to get big nations onto your color, and kick the nations with small economies off. But, there's more. The bonus isn't a % bonus to gross income, it's actually a per-turn flat amount. 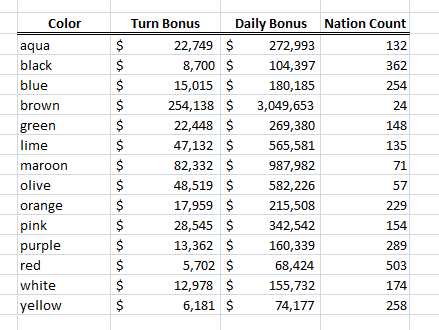 Beige nations will always get $50K/turn, and Gray nations will always get $0/turn, but for the other 14 colors, it will be dependent upon the given alignment of nations at the end of each turn. You will still have to be on the same color as your alliance to get the bonus, however. And the length of time between changing colors for your nation will be increased to 5 days. But, the flat-rate income will help new nations grow, without really accelerating the growth of large nations in any meaningful way, helping to promote "catching up" and a less divided game overall, which is something you guys have been asking for for a long time. 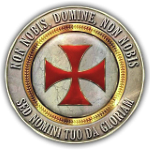 Another thing that will become implemented is a new player bonus, which is a 100% gross income bonus for nations with 1 city, 90% bonus for nations with 2 cities, 80% for 3 cities, and so forth until 11 cities, at which no bonus is applied any longer. This extra income is just to make the game easier for new players, help them catch up, and hopefully, stick around. There are various other improvements coming as well; bug fixes, those better information popovers, and more. I am hoping to have this all implemented on August 5th for P&W's 4th birthday. As well, I'll hopefully have the 4th birthday award special offer figured out soon, which I imagine many of you remember from previous birthdays. Now that you all know what I know, I'll be happy to answer any questions, and I hope that you're all as excited as I am! EDIT: I'll add as well that for naming Color Trade Blocs, you are required to include the color name in the bloc, to avoid confusion. But otherwise, there are no rules, aside from the usual no profanity, no nazism, etc. I love the Flag implementation for one, and the Color Bloc thing might trigger a lot of people, but tbh we've been complaining about a somewhat exciting and mechanic change to the game for ages now, so I wont complain for one bit, I genuinely like it. Will we be able to see which bloc has how much bonus? I like it, seems fun to adapt too. IT'S BAAAAACK! COLOR STOCKS ARE BACK AFTER SO MANY YEARS! Flags: Means I save about 20mil on the market. Actually, I think this is a really great idea, it will also boost the economies of micro alliances and is more rewarding for raiders in the lower tier. So, are you going to go forward with the war changes that have been tested and implemented on the test server as well, or are those going to be discarded? "And the length of time between changing colors for your nation will be increased to 5 turns." increased from 24 turns to 5 turns? I am guessing this is a typo. Say I am in beige and i want to declare war. That will get me kicked to gray and i won't be able to change colors for a long time. Is there a fix fr that? No, I am not implementing any war changes with this update. It is a typo, I meant 5 days. You can always change your color from Beige before you declare a war. Is there any way we could see the current bonuses that each color would have this point in time? Of course colors Brown and Maroon would be reduced to $75,000/turn as that is the max. Beige would also get a flat $50K/turn regardless of economy size or nation count, and Gray always has $0/turn. Vacation Mode nations would not affect these figures as well, of course. Looks good, as long as its balanced. Have to wait to see on that. My only concern is the bonus being based on average income, as that seems to disproportionately hurt lower tier mass member alliances, and incentivizes alliances to band together with upper heavy alliances. Suppose it depends how much the bonus is. Also if that breaks this tiering bloc metagame, suppose its for the better. The switch to flat income amounts is a good call generally too, noobs don't make any money for a bonus to apply too. Free flags is going to be interesting, designers will be getting a lot of business now I suspect. Also just to clarify, are trade blocs limited to one per color? IF so, how are names decided, IF not, how do you prevent alliances from placing their upper tier into one trade bloc and their lower tier into another one. It looks like trade blocs aren't tied to alliances, or am I mistaken? EDIT: NVM I read the full post instead of skimming it. Ok that all looks good. I'll just respond anyway to clarify for everyone else; yes there is one bloc per color (each color is a bloc) and names are decided by majority vote. They will all start with some lame made-up names by me, and each turn if there is no majority vote for a name then whatever the existing name is will be kept. To get the bonus, you do have to be on the same color as your alliance. That will (theoretically) keep alliances all together one the same color. It is possible alliances will split apart to get larger bonuses, and that could become an issue that I have to address by changing the game mechanics, but I am willing to wait and see how it turns out in practice first. 2013, we meet again. I'm curious to see how well various alliances police their colors. I remember a lot of work in the old days to that effect, but there was always the challenge of small or inactive nations you couldn't reliably hit, or just wouldn't care, dragging down the bonus of even the most tightly controlled color. It may be worth considering basing the average income on nations within an alliance, or alliance over 5 members. That would reduce the dilution from the masses of inactive and 1-2 city nations who dragged the system down last time, which should also heighten the tension between major alliance to secure their own colors. Nevermind I totally forgot that inactive nations get their color changed to grey now, so the old issue shouldn't be nearly as big of a problem. You missed white and yellow. Are people automatically placed into a bloc based on their color? Or do they have to "join"? Also if that breaks this tiering bloc metagame, suppose its for the better. If anything this will further incentive tighter tiering. There is no detriment to evry top tier AA being on the same color, where there is when they start letting in lower ANS alliances. Maybe blocs across multiple tiers will try and force out lower tier AA's from other blocs while keeping their own. That way they boost the growth of their lower tier allies at the sacrifice of growth in the higher tier bloc members, but that's the only scenario I can think of and it doesn't seem as likely. Maybe it will happen as the flat bonus is worth more to lower tier nations, but even at 10mil per day in income, if you can get the full bonus you are getting nearly 10% increase, so there is still good incentive among the higher ANS alliances to regulate their colors. Even making 20mil a day its still the equivalent of a treasure. You'll note that the names of the Blocs are required to include the name of the color they're representing to avoid confusion. Wow, I can't believe I did that. Here's the updated list, I just lobbed those two off accidentally. If anything this will further incentive tighter tiering. There is no detriment to evry top tier AA being on the same color, where there is when they start letting in lower ANS alliances. Maybe blocs across multiple tiers will try and force out lower tier AA's from other blocs while keeping their own. That way they boost the growth of their lower tier allies at the sacrifice of growth in the higher tier bloc members, but that's the only scenario I can think of and it doesn't seem as likely. You're right, all the top tier nations could join the same color together, but their bonus is limited to $75K/turn max. Nations at 15 cities average over $4,400,000 in monetary net revenue daily, and $900K/day is only about a 20% income increase for them (11% increase for 20 city nations). If the max bonus becomes too much, it can easily be lowered as well. I think larger nations will enjoy having a lot of sway over smaller nations and being able to use their economic power as leverage more than they will clustering together onto one color. The other fact is that if they do all cluster together, smaller nation alliances can just piggyback off of them by moving to the same color. If anything this will further incentive tighter tiering. There is no detriment to evry top tier AA being on the same color, where there is when they start letting in lower ANS alliances. Maybe blocs across multiple tiers will try and force out lower tier AA's from other blocs while keeping their own. That way they boost the growth of their lower tier allies at the sacrifice of growth in the higher tier bloc members, but that's the only scenario I can think of and it doesn't seem as likely. Maybe it will happen as the flat bonus is worth more to lower tier nations, but even at 12mil per day in income, if you can get the full bonus you are getting nearly 12% increase, so there is still good incentive among the higher ANS alliances to regulate their colors. It will incentivize upper tier tiering, but not lower tier. If lower tier people pursue upper tier allies, some of them will likely accept, so in effect it reduces the incentive. Plus the bonus is capped at 900k per day per nation, which is decent on a large scale but nothing to stake yourself politically on. That number is more significant to lower tier nations, upper tier nations would scoff at it. This all assumes people adjust to the meta and change their group color to a single color, which some alliances will do, others have too much of a stake in their color to do it I expect. You're right, all the top tier nations could join the same color together, but their bonus is limited to $75K/turn max. Nations at 10 cities average over $10,000,000 in monetary net revenue daily, and $75K is only about a 6% income increase for them. One thing I didn't think of was the fact that higher tier AA's can't actually kick out the small guys even if they wanted to. 75k per turn though is 900k per day. Sure, its only 6% of revenue for a 10 city, but its free money, and as a percentage of profit it will be much higher. At 20mil in daily profit it still represents a treasures worth of income increase, not as important sure, but even just at 10mil profit its a 10% bonus to that. And 10mil in profit (monetary, not counting resource selling) would put you solidly in the tip % of players. But still, higher tier AA's cant declare war on lower ones, so if they banded together to keep a color, they couldn't actually prevent lower guys coming in. Thus necessitating their own lower tier allies to help police across all the tiers. So having thought a bit more, I think this does solve most of the issues I remember from the color stock in 2013.